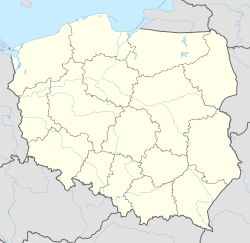 For other places with the same name, see Brzezinka (disambiguation). Brzezinka [bʐɛˈʑiŋka] (German: Birkenau, Czech: Březinka) is a village in southern Poland, about 3 kilometres (1.9 mi) from Oświęcim (Auschwitz), in the district of Gmina Oświęcim, Oświęcim County, Lesser Poland Voivodeship. The village is near the confluence of the rivers Vistula and Soła, at the very center of the Vistula Valley, 240 meters above sea level. By the time of the construction of the first railroad station in 1856 the station was on Brzezinka's territory, but later it was transplanted to nearby Oświęcim (Auschwitz). Two major factories are found there: Maszyn Górniczych "Omag", which in the 1930s, called Spółka Akcyjna Zjednoczenia Fabryk Maszyn i Samochodów "Oświęcim" (Auschwitz United Machinery and Automobile Manufacturing Inc.) produced the "Oświęcim-Praga" which won a Monte Carlo Rally; and the Polinova Company (popularly known as Papownia). The name of the village stems from birch trees (Polish: brzoza). It was first mentioned in 1385. From 1440 to 1483 Brzezinka was owned by Jan Brzeziński. Politically the village belonged then to the Duchy of Oświęcim, formed in 1315 in the process of feudal fragmentation of Poland and was ruled by a local branch of Piast dynasty. In 1327 the duchy became a fee of the Kingdom of Bohemia. In 1457 Jan IV of Oświęcim agreed to sell the duchy to the Polish Crown, and in the accompanying document issued on 21 February the village was mentioned as Brzesinka. The territory of the Duchy of Oświęcim was eventually incorporated into Poland in 1564 and formed Silesian County of Kraków Voivodeship. Upon the First Partition of Poland in 1772 it became part of the Austrian Kingdom of Galicia. After World War I and fall of Austria-Hungary it became part of Poland. It was annexed by Nazi Germany at the beginning of World War II. After this annexation the village was chosen by the Germans as the site of their Auschwitz-Birkenau (Auschwitz II) death camp, whose remains exist along with Auschwitz I as state museums to commemorate the victims of Nazism and the Holocaust. After the war it was restored to Poland. On 1 April 2007 Brzezinka was featured on The Amazing Race: All-Stars. ^ Prokop, Krzysztof Rafał (2002). Księstwa oświęcimskie i zatorskie wobec Korony Polskiej w latach 1438-1513. Dzieje polityczne (in Polish). Kraków: PAU. p. 151. ISBN 83-88857-31-2. This Oświęcim County location article is a stub. You can help Wikipedia by expanding it. This page was last edited on 5 June 2017, at 21:19 (UTC).